A young girl with Down syndrome has come leaps and bounds since surviving open heart surgery as a newborn. Ten-year-old Lucie Fickling weighed just seven pounds at birth and under went major surgery for a heart defect aged just three months old. Despite a difficult first year, the sprightly youngster has gone on to win top awards in scouting and gymnastics. Lucie joined the First Northolt Sea Scouts, based in Dabbs Hill Lane, Northolt, as a beaver four years ago. After months of hard work to collect 15 badges, two weeks ago she was awarded the Chief Scouts Silver award - one of the highest accolades for a young cub. But that was not her only taste of success. 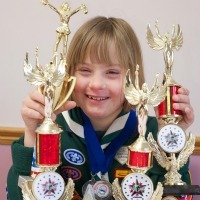 The sporty youngster has travelled to Florida to compete in the World Cheerleading Championships and recently won two silver medals for the vault and floor at the regional finals of the Gymnastics Movement for People with Disabilities. And now Lucie has been nominated as Young Person of the Year in the Ealing Gazette's annual Pride in Our People awards by her proud godmother Dawn Ward. She said: "She's so enthusiastic in everything she does despite her disability and she never lets it hinder her. She does find things difficult but she perseveres and perseveres until she gets there." Her mother Tracey Fickling said: "The first three months of her life she slept and we couldn't do anything with her because of her heart. She was in hospital for three weeks and slowly progressed. "She's excelled so much. She loves her gymnastics. She works so hard and she's a determined little girl. It makes me so proud because she has to work so hard to achieve what she does." Tracey said joining the scouts was a great opportunity for Lucie, who attends Hedgewood Special School in Hayes, to mix with mainstream children. It's very impressive and touching to know that someone as young as this has already overcome so much. I wouldn't be surprised if things only get better for her. Welche Digitalkameras sind robust und einfach für Kinder im Alter von 7-11 zu bedienen? Viele Kinder im Alter von 4 oder 5 können mit Digitalkameras umgehen. Sie sind in vielerlei Hinsicht einfacher zu benutzen als 35-mm-Kameras, solange es Point-and-Shoot-Kamera sind, und sie bieten. Holen Sie WoW Gold für professionelle Spieler ist sehr einfach? MMOGGG zusammen, um den Kauf und Verkauf von WoW Gold zu diskutieren, hat eine Video-guide, Ihnen beizubringen, wie man eine Menge WoW Gold auch nur brauchen, um ein wenig Zeit zu verbringen.